Dr Yvonne Daniel and Joan Henthorn MBE are laboratory advisers to the NHS Sickle Cell and Thalassaemia Screening Programme. 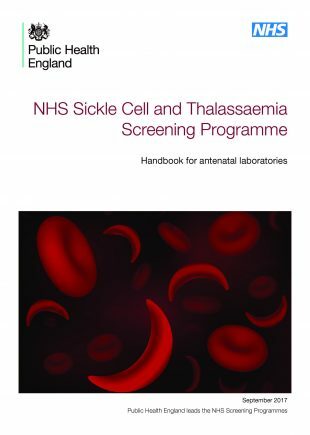 In this blog article, they are pleased to announce the publication of an updated version of the antenatal laboratory handbook for the NHS Sickle Cell and Thalassaemia (SCT) Screening Programme. The SCT programme screens pregnant women to find out if they’re at risk of having a baby with sickle cell disease or thalassaemia major, which are serious inherited blood conditions. This gives parents time to consider the options available. The programme also screens newborn babies for sickle cell disease, helping to make sure babies get the best support and treatment from the very start. To meet the needs of screening professionals and laboratories, we’ve divided the handbook into 2 separate publications – newborn and antenatal. We reviewed best practice to develop the updated antenatal handbook. They shared drafts with the laboratory sub-group for feedback. There are 2 main revisions. The sections on interpreting results and reporting findings have been reviewed and revised. The new streamlined version includes hyperlinks to PHE Screening information and external organisations. This means information which may be subject to change, such as contact details, standards and specifications, will not become out of date. We hope you find the new handbook useful.